Bill Cassidy Defeats Mary Landrieu In La. Senate Runoff : The Two-Way The Republican congressman pushed out the incumbent senator, boosting the GOP majority in the Senate. 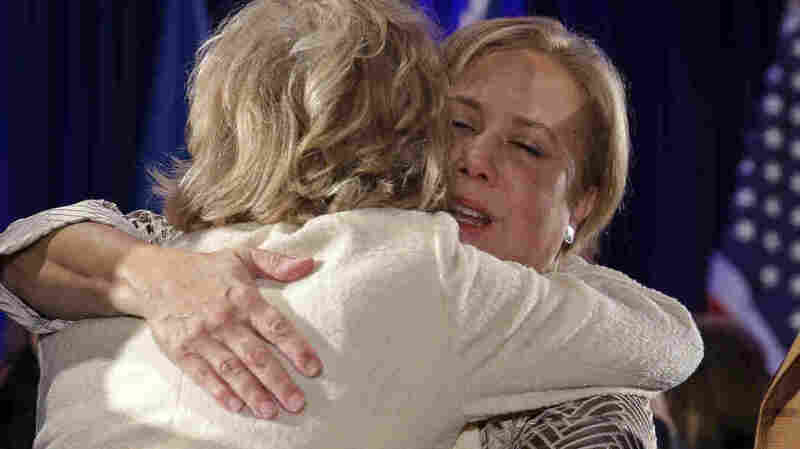 Sen. Mary Landrieu, D-La., hugs supporters after conceding defeat in her Senate runoff election against Rep. Bill Cassidy, R-La., on Saturday. NPR's Debbie Elliott reported Friday that Cassidy, who has pledged to repeal Obamacare, followed a campaign strategy of linking Landrieu to Obama, highlighting her support of the unpopular president. Landrieu, meanwhile, faced funding challenges. "With the midterm elections settled elsewhere, and control of Capitol Hill solidified for the GOP, Mary Landrieu has been left largely to fend for herself," Elliott reports. "National Democratic groups have pulled spending for the Louisiana runoff." Landrieu was the last remaining Democratic senator from the Deep South.